Multiple organ failure is a significant complication in traumatic injury, and can be exacerbated by a failure to adequately monitor and control trauma patients’ core body temperature in emergency departments (EDs). Nearly half of trauma patients are hypothermic on arrival at emergency departments, often due to factors beyond the control of emergency service responders and during on-scene resuscitation attempts. 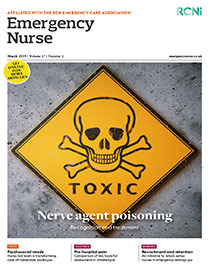 This article examines the physiology of the ‘triad of death’ –hypothermia, metabolic acidosis and coagulopathy – to highlight the importance of monitoring and maintaining normothermia, or normal body temperature, which is between 36.0C and 37.2C, in trauma patients to improve outcomes. It also describes some rewarming interventions that can help to save the lives of patients with multiple injuries. Major traumatic injury is the leading cause of death in people under 40 years of age in the UK. Among major trauma patients, 75% are male and 98% of injuries are caused by blunt force such as falls or road traffic incidents (National Institute for Health and Care Excellence (NICE) 2015). The cost in terms of lost economic output is variously estimated to be between £3.3 billion (National Audit Office 2010) and £3.7 billion a year (Scott 2016). Multiple organ failure is a significant complication of traumatic injury, and is exacerbated by failure to adequately monitor and control the patient’s core body temperature in ED. On arrival at ED 43% of trauma patients are hypothermic (Allen et al 2010), often due to factors beyond the control of emergency service responders, such as complicated extrications in adverse environmental conditions. Initial resuscitative attempts on-scene can further reduce core body temperature, because of prolonged exposure to the environment and administration of cold intravenous (IV) fluids (Duchesne et al 2010).